Invest your wealth with the help of a seasoned team and a powerful, cost-effective online service. Invest in high-quality, fully-managed portfolios and watch your savings work harder for you. Discuss your options with one of our advisers and design your pension investments to meet your goals, whether you’re saving or drawing down. Retirement may never have looked so good. Set up multiple portfolios with varying risk levels so that you and your family are ready for whatever life throws at you. If you are time poor, cash rich and looking for somewhere to invest, who are you going to call? Up to now the answer has been a wealth manager… However, a new online wealth manager is offering a similar service for half the cost, at the click of a button. Developed by our technology and investment experts, our online service allows you to plan for different outcomes and model for tax, inflation, timeframe and risk levels. You can then invest in high-quality managed portfolios designed to help achieve your goals. Netwealth has created an investment team dedicated to giving you peace-of-mind and to saving you time. Invite up to seven additional family members or friends to your network and drive fee benefits for the whole group. Intergenerational investing: a win for the whole family. Setting up a network is incredibly easy. In our case, three generations benefit from lower fees, while our individual accounts remain private. We make use of cutting-edge technology to deliver our service — never compromising on quality or security — at a cost that is substantially below those of conventional wealth managers. * Assumes an annual gross return of 5.3%. The traditional wealth manager fee of 1.86% is calculated as the average total expense ratio (TER) of the wealth managers listed in research by Numis and Citywire published by Citywire Wealth Manager in February 2015. 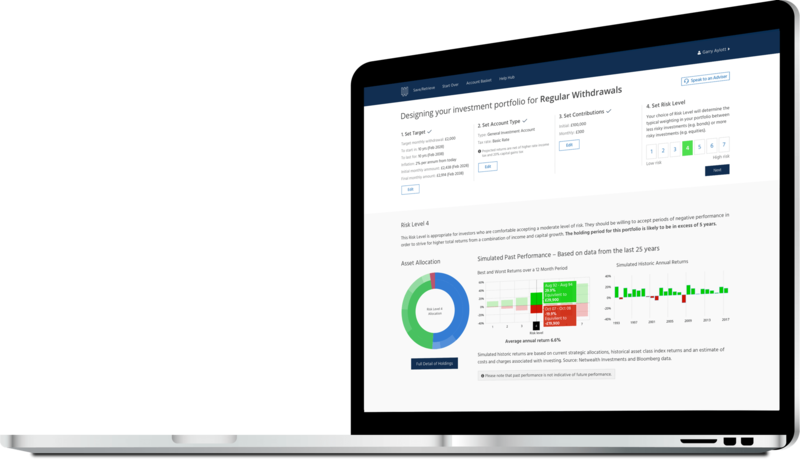 The TER for Netwealth is calculated as 0.7% based on the 0.35% all-in fee, 0.30% estimated all-in underlying fund costs and 0.05% estimated annual costs of trading.